It is not known when this farmhouse was built nor has any investigation of its detailed layout and construction been made. The first mention of it is in a document of 1691, now lost, when its owner was `Mr' Watts, and subsequently Miss Hannah Watts. At the end of that century, Richard Watts also owned the substantial Stidcote House (demolished in the 18th century) but it is doubtful if the Watts lived in either of these houses; in 1747 Hannah's home was at Toddenham, NE of Moreton-in-Marsh. This document of 1691 gave the occupier as Francis Boyes, who subsequently sub-let the house on moving to farm at Stidcote. Francis Boys (alias Boy, Buoy, Boyt) was a Quaker and refused to take the oath of allegiance or to pay tithes. Was Watts a sympathiser and accepted him as tenant both at Bishop's and at Stidcote? A note on the reaction of the Church to this non-payment of tithes is in Section Eleven. The property, with others elsewhere, was sold in 1747 to a Mr Mander, for £140 and an annuity of £12 p.a. Mander, also, was an absentee landlord. Fourteen years later, in 1761, he sold the farm to the sitting tenant, John Smith, yeoman, who transferred the house to his son as a marriage settlement when the latter married Martha Hobbs in 1772. Death left Martha a widow in 1788, but she carried on with the farm; out-living her son, she died in 1823, leaving the farm to her daughter-in-law Hannah, nee Pullen. Hannah continued to live at Bishop's. By 1830, six of her seven children had married or died; only Martha, baptised in 1815, remained unmarried, and she baptised a son in 1833, named William Drew Smith. Two years later she married Richard Drew, who moved into Bishop's, where six more children were born. Hannah died in 1849, when the Drews moved to Hawkins's and subsequently to Horseshoe Farm, Falfield. No Smith was any longer interested in the property; Hannah's eldest son lived at Cambridge or Slimbridge and let the farm, mortgaging the property further and further until William Gillman of Dursley foreclosed in 1875 at a cost to him of £960. Nine years later he sold it with eight acres to H L Hardwicke for £800. 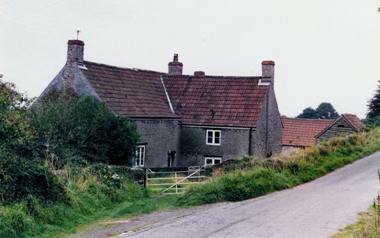 Fifty years later, the farmhouse, now with twelve acres, was sold to Harry Blanch (at Hawkins's) for £640. This was in 1936, immediately before the revival of farming in advance of the looming war. 53 whom the farmhouse is now named, followed by his son, who raised a family at Bishop's Farm. He died aged 46; his widow brought up the young family while continuing the tenancy. In 1909, Charles Clements Daniels (born at Hawkins's in 1883) married Annie Savery Eacott and took the tenancy of Bishop's but could not make a success of it. 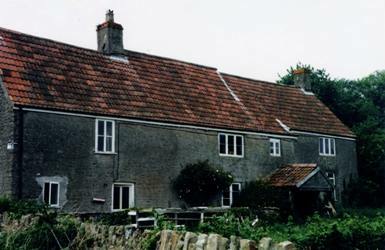 In the early '20s, Edward Richard Andrews was the tenant, followed by S R Skrene, who paid an annual rent for the farmhouse and 7 1/2 acres of £40. When Skrene gave up the tenancy in 1940, Blanch offered the farm to the Skuse family, some of whom worked for him on his own small farm. When Blanch died in 1962, he left the property to a relation, who subsequently sold it to Denis L Skuse.